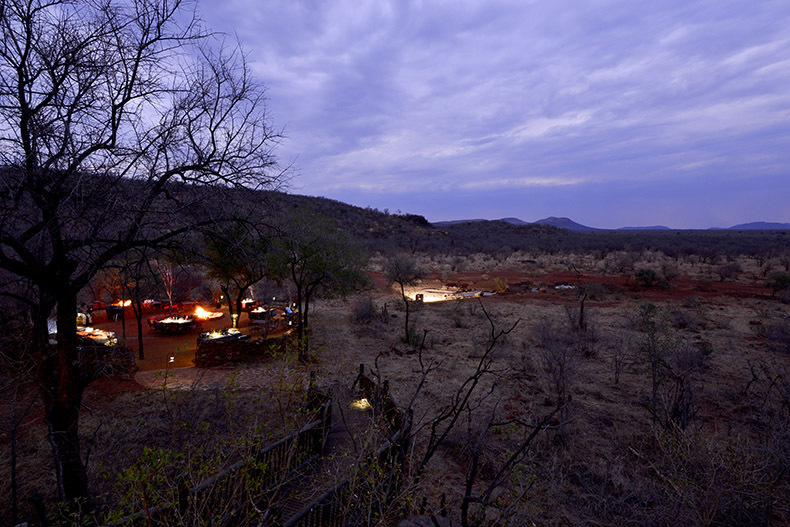 Etali Safari Lodge is nestled near the center of Madikwe Game Reserve. 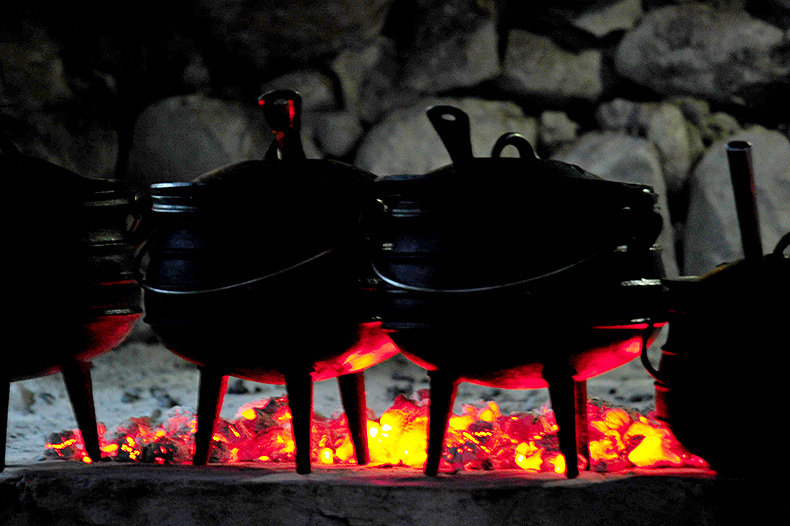 The lodge is easily accessible via the Molatedi Gate, just a three and a half hour drive from Johannesburg. 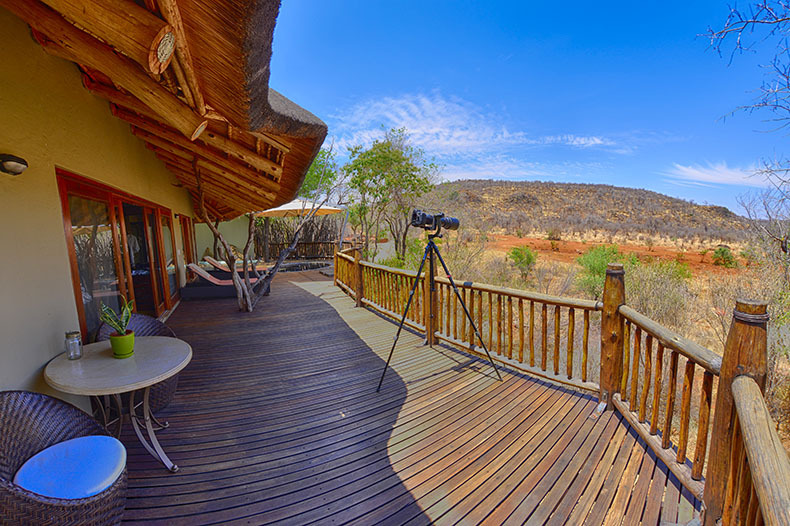 This stunning five star semi fenced lodge is perched on a small rocky outcrop overlooking a waterhole and surrounded by boulders and hills. 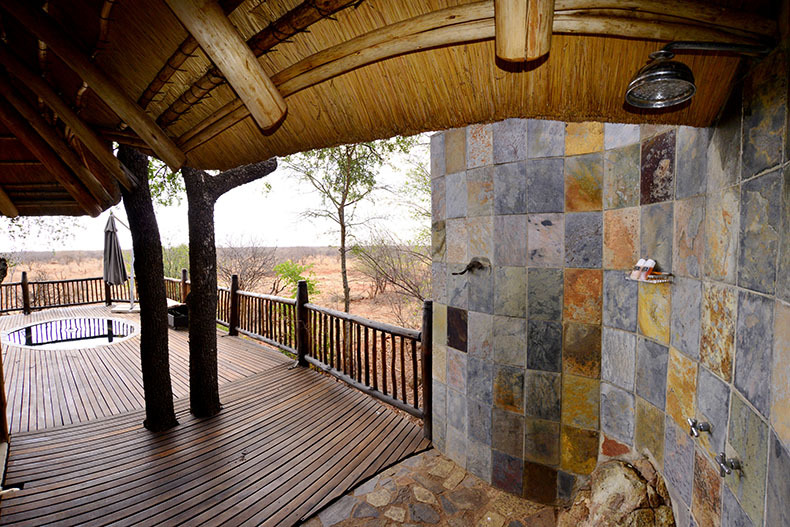 It offers a great bush experience where nature, relaxation and luxury combine to form an unforgettable experience. After a warm welcome by Angie and the Etali team, we were shown round the lodge. 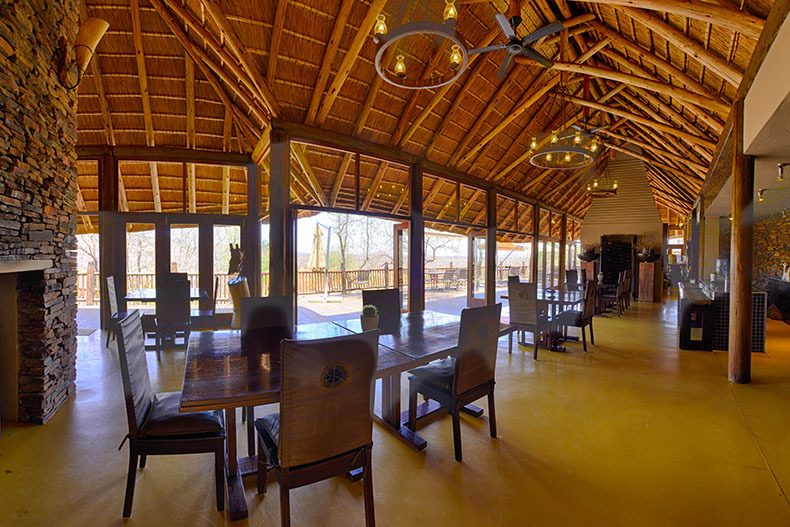 A pathway leads down to a reception area on your left, small curio shop on your right and the path then leads you into the main thatched dining area of the lodge. A lounge with large fire place lies just behind the dining room’s fire place and both these fireplaces provide warmth for those cold winter months. On the other side of the dining room is a lovely wine cellar with a large bar just behind it. 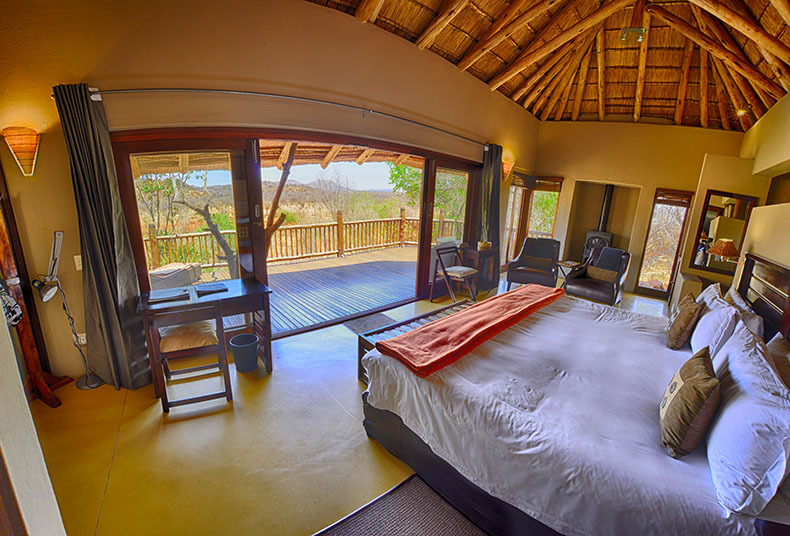 The whole main area has large folding doors that open up onto a long wooden deck that overlooks the boma and waterhole. 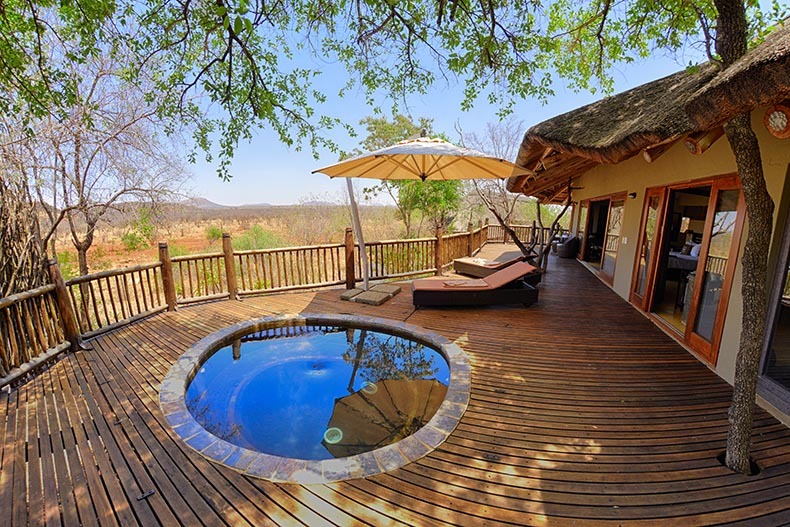 Just off the bar area is a raised rim-flow swimming pool with loungers and a stunning view over the waterhole. The waterhole is a hive of activity with animals coming and going all day long. 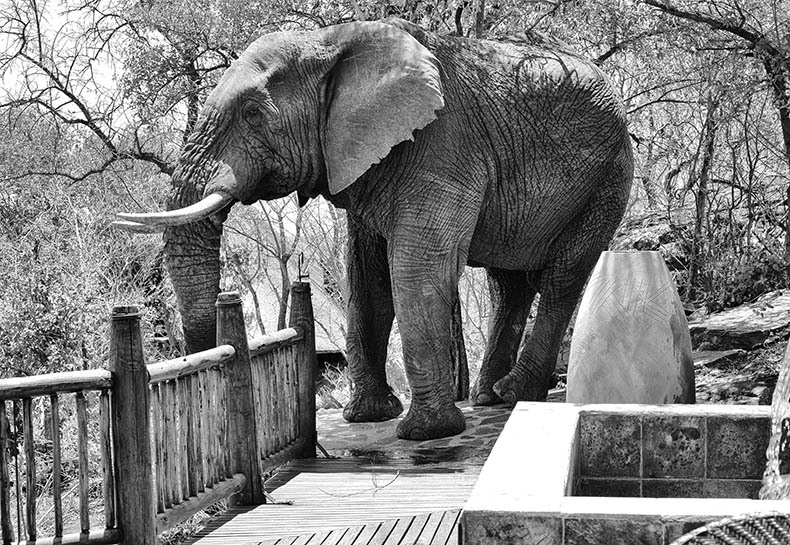 We even had a large bull elephant pop into the lodge for a visit. He walked right past the pool and down to the waterhole. The lodge is partly fenced, so you will be escorted to you rooms after dinner. 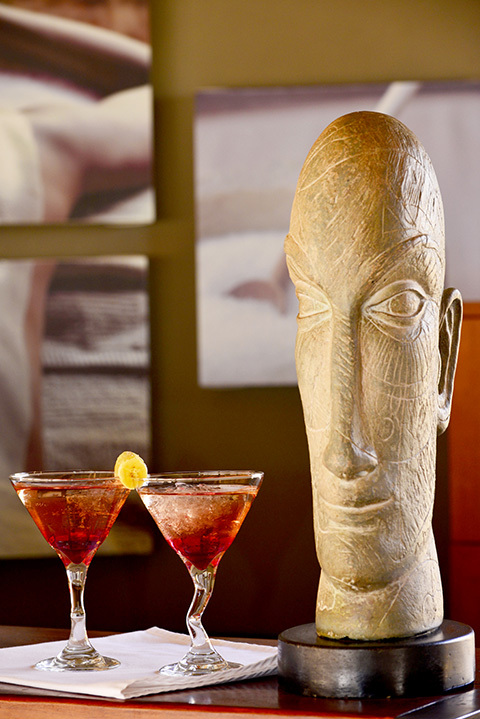 The wine cellar at the end of the dining area is where you will find a selection of house wines while local beers, soft drinks and bottled water are on offer at the bar. 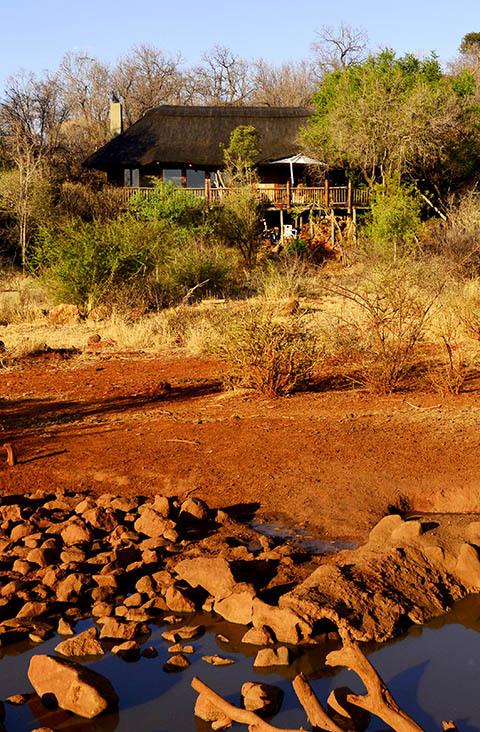 We had most of our meals on the wooden deck overlooking the waterhole thanks to the stunning weather. 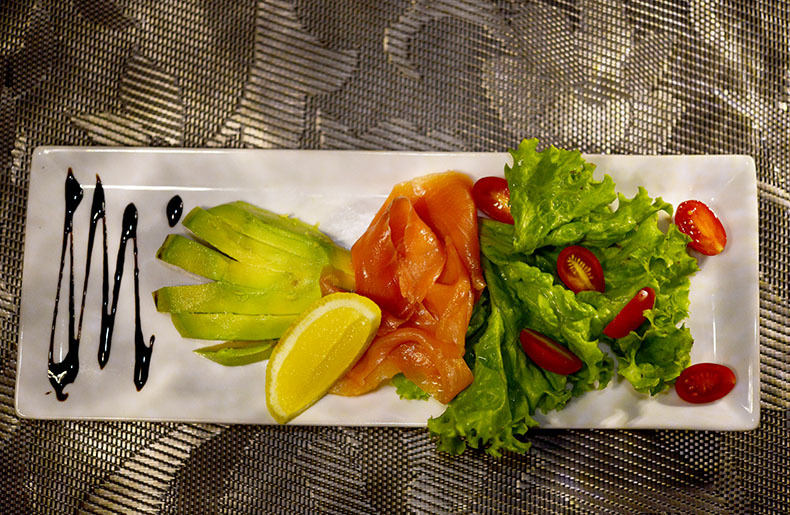 All our meals were tasty and all freshly prepared. 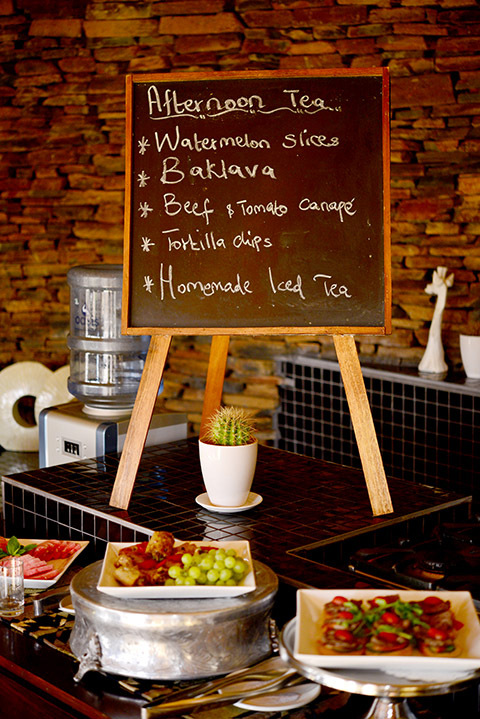 Breakfast is served after your early morning game drive and you have a choice of fruits, yoghurt, juices and muffins which are set out in the dining area, then a hot breakfast of eggs and bacon are served at your table. 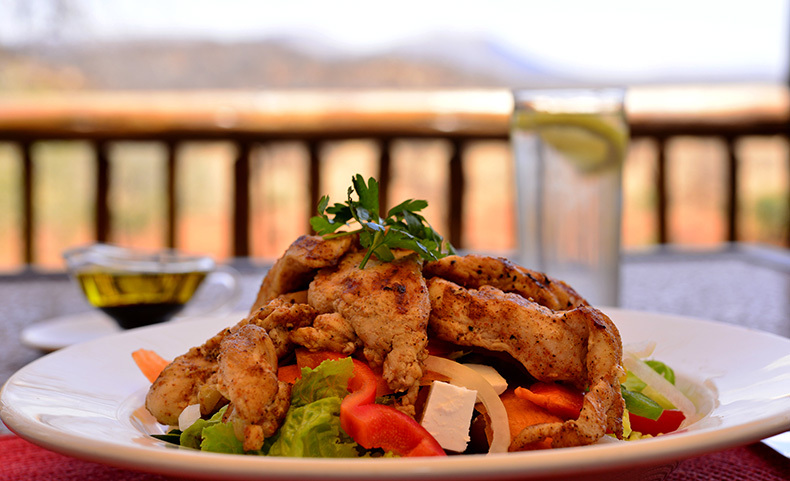 A light lunch is served between 12 and 2pm - I had a lovely grilled chicken salad. High tea is a real treat with a great selection of goodies to choose from; like velvet butterfly cakes or scones with an iced tea. 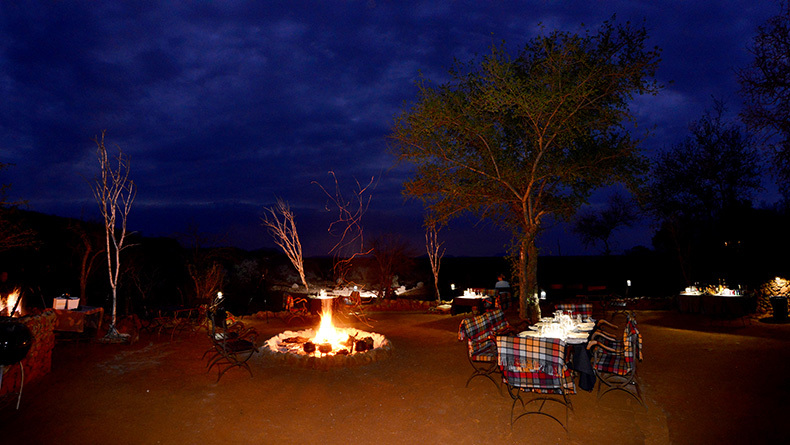 We also had dinner in the Boma that is situated right next to the waterhole; we had traditional South African dishes of assorted braaied/grilled meat, salads, vegetables, stews and desert. Our four course dinners were all tasty and well presented; for starter we had Salmon and Avocado followed by pineapple sorbet, for the main course we had grilled kingklip with shrimp sauce and dessert was a trio of chocolate. Nothing was too much trouble for the Etali team even when Mario was not well they wanted to prepare something special for him. 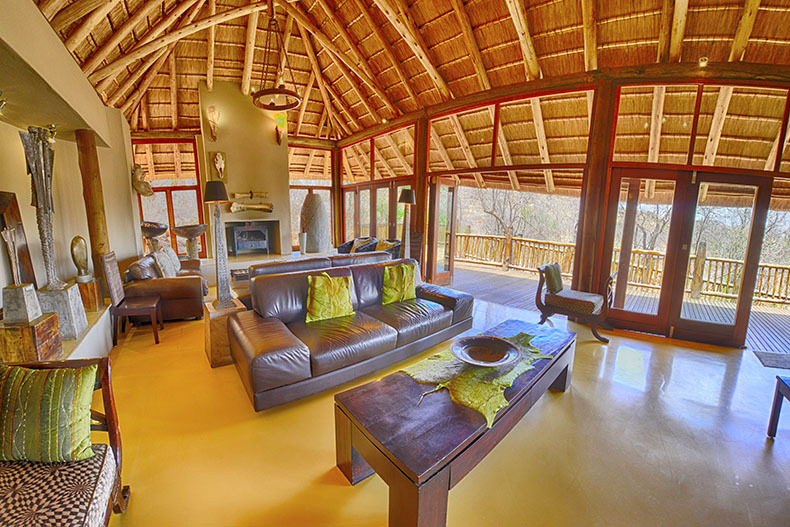 There are 8 luxury suites, 5 on the left (SE) of the main lodge and 3 on the right of the lodge (NW). The suites are spacious with folding doors opening up onto a large private wooden deck with plunge pool, loungers and table and chairs. 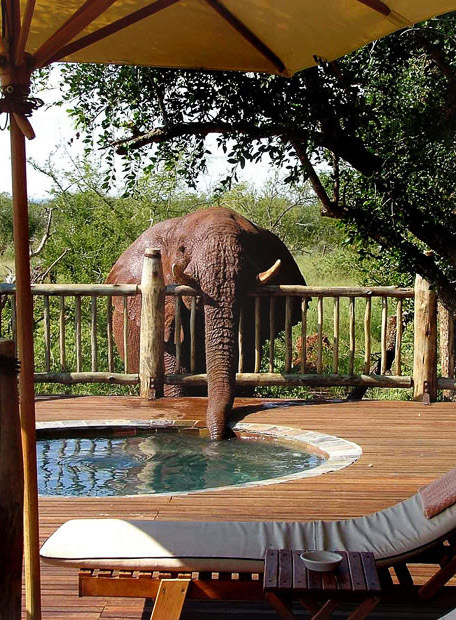 Even the elephants love the plunge pools...! 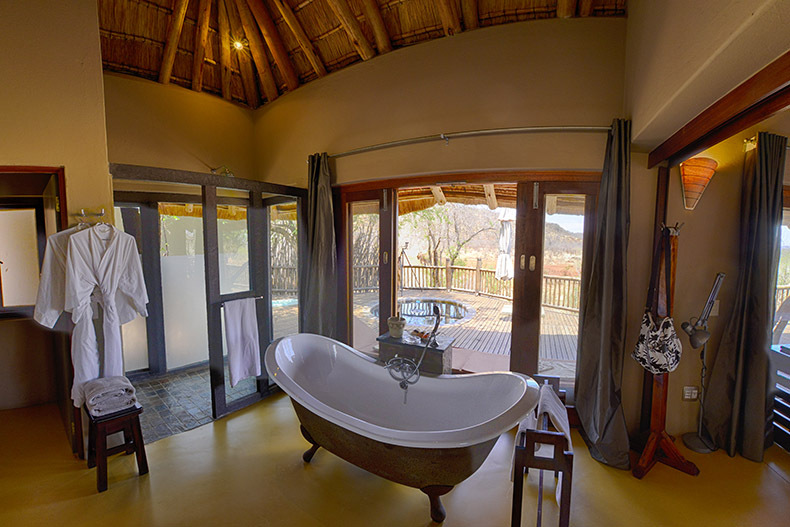 Each suite has a fireplace, heater, air-conditioning, fan, a fully stocked mini bar, king-size bed, large en-suite bathroom with large bath and indoor shower and a lovely outdoor shower. The Wellness Centre/Spa, which is just next to the main lodge offers massages and other treatments and there is a gym and steam room. Our field guide and tracker were great and had a good deal of knowledge about the African bush. We went on 6 game drives over a three day period, an early morning and a late afternoon drive each day but guided game walks are also available upon request, please ask when you make your booking. What I enjoyed was the big bull elephant that paid us a visit at the lodge, Mario grabbed his camera and I ran out after him. 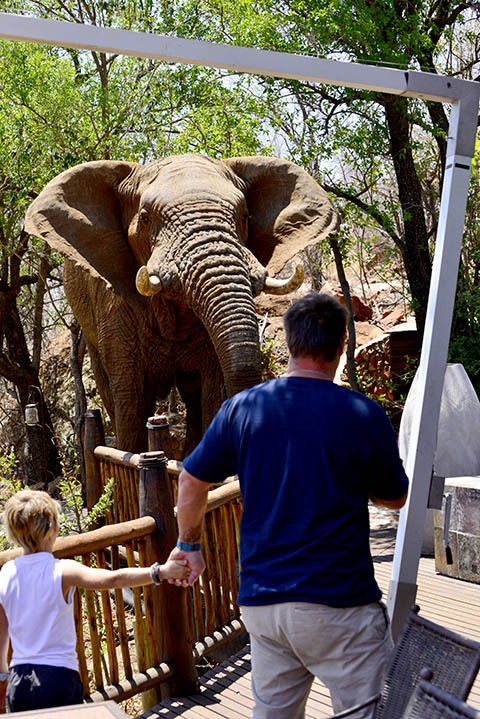 We got the elephant just in time because he was behind reception then walked past the swimming pool and our suite then down past the deck on his way to the waterhole….what a great experience! We had some fabulous sighting on our game drives, we saw the Big 5 during our 3 days at the lodge. It was great seeing the elusive leopard at last which our tracker spotted. 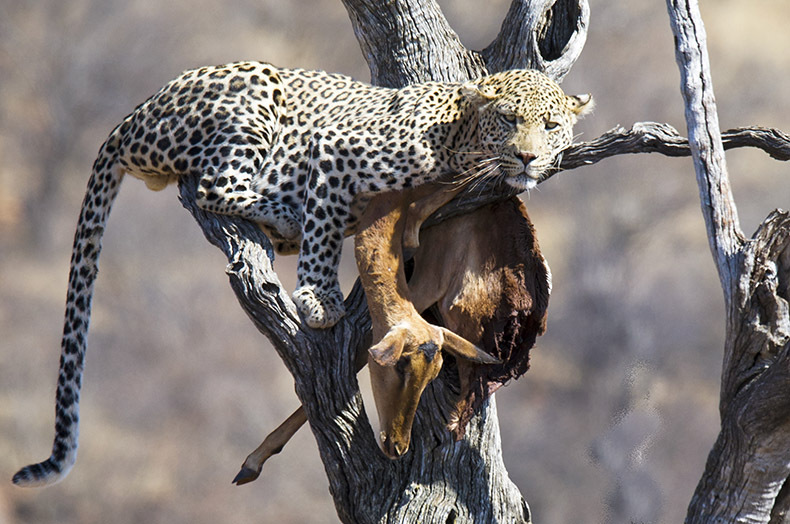 The leopard was up a dead Leadwood tree with an impala kill…lighting was not great but a lovely sighting none the less. 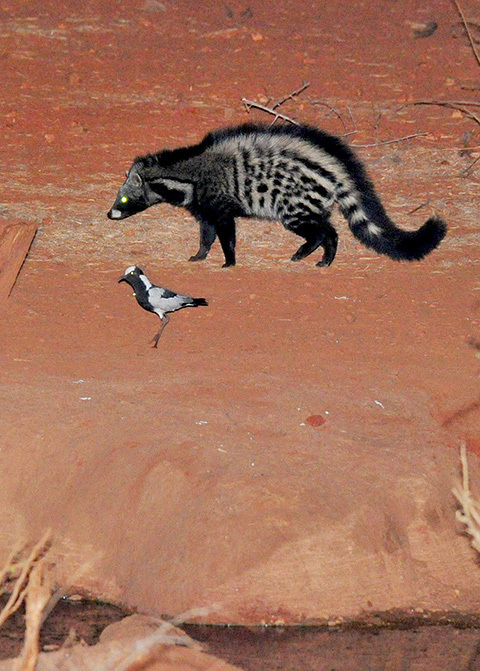 Bird-life round the lodge is prolific and the waterhole attracts plenty of game day and night. Thank you so much to Koos, Susan, Angie and your amazing team.